Wind attacking lungs, cough, itchy throat, fever and chills, sore throat, aversion to wind, whooping cough, flu are some of the imbalances satisfied clients have used this product for. Aster tataricus root, Stemona sessilifolia root, Cynanchum stauntonii rhizome, Schizonepeta tenuifolia herb, Platycodon grandiflorum root, Citrus reticulata peel, Glycyrrhiza uralensis root. - Zi wan, Bai bu, Bai qian, Jing jie, Jie geng, Chen pi, Gan cao. 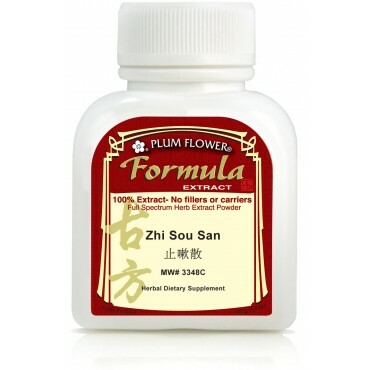 Zhi Sou is drying and should be avoided in individuals with yin deficient cough, lung heat and cough from lung phlegm heat. Not for use during pregnancy.